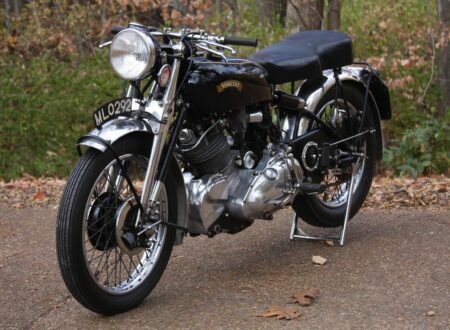 This article was written by Walt Siegl of Walt Siegl Motorcycles – when possible we like to bring you the story of a motorcycle in the words of the person who built it to cut out the middleman, giving you unfettered access to their thought process and methods. 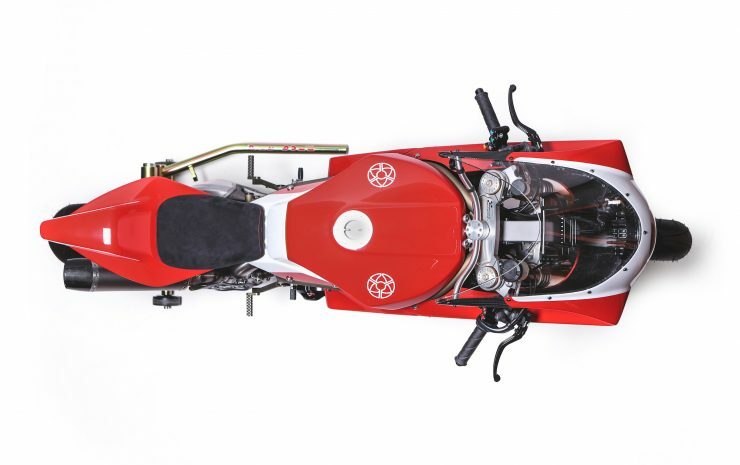 It was a natural progression from building bikes with Ducati two-valve air-cooled engines to finally including a high performance liquid-cooled four-valve Ducati engine to the WSM collection. I wanted to build a completely new bike with a perimeter frame that allowed me to use both Ducati engine configurations: air-cooled 2-valve, and liquid-cooled 4-valve, with as much of the components built in-house as possible, and all other components of the highest quality available. 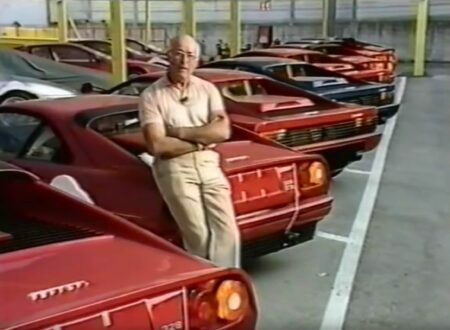 I did not want to ignore the trusty two-valve engine, because I, and many of my clients like it so much. 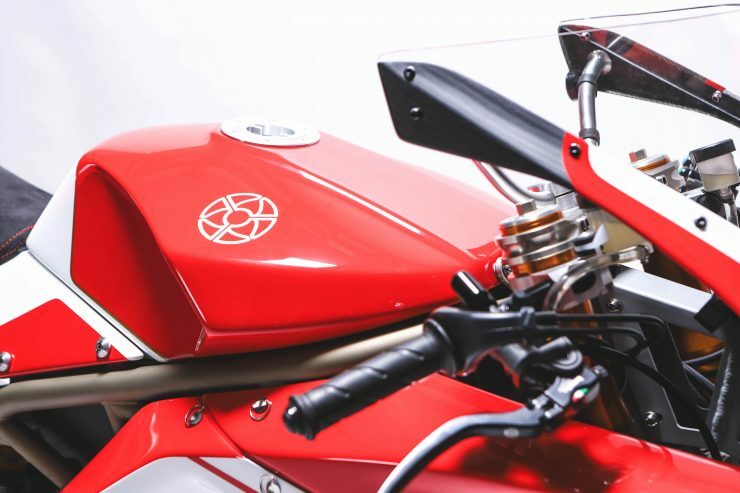 So I designed a perimeter frame with World Superbike geometries that could hold both four-valve and two-valve engines. 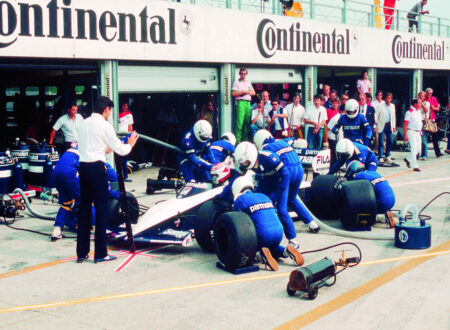 Initially I was working with factory geometry numbers for the lightweight chrome-moly frame. But my lead technician, Aran Johnson, found World Superbike geometry numbers, which we were able to apply to the new WSM frame. 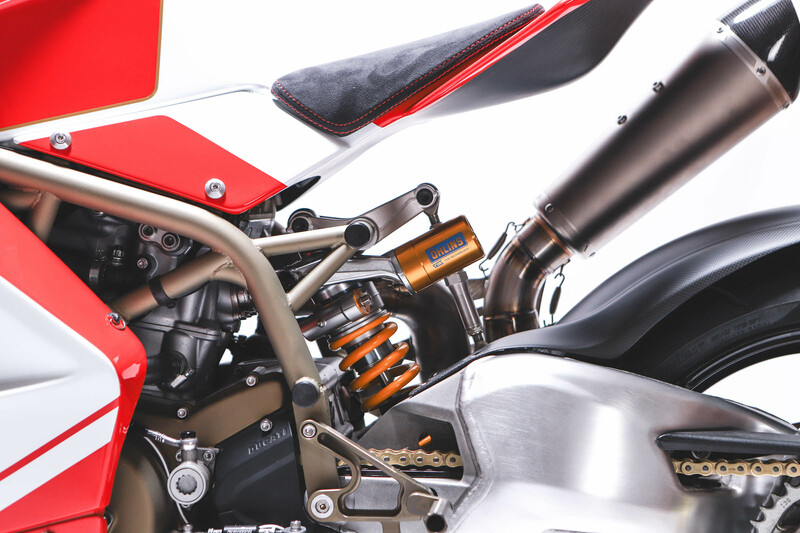 The combination of suspension components and geometry numbers is fully adjustable and allows you to go from street racer to a really quick-steering scalpel for the race track. With this Superbike, I wanted to hold on to what is so dear to most Ducatistas, which is, of course, the trellis frames, the rattling dry clutches, the torquey thrust of the long stroke motors. It’s a visceral experience. 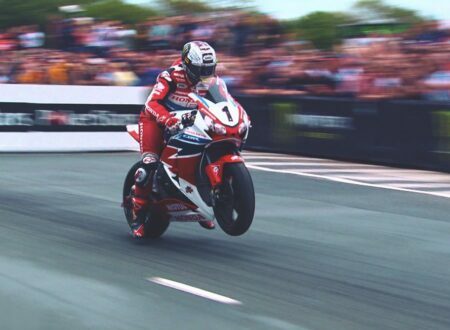 Granted, all this involves the rider much more than other brands. Ducatis are kind of tender but very powerful at the same time. (It’s that special sauce.) They talk to you. They have a way of needing your attention when you ride them. They make you feel good. So I wanted to hold onto all of this. As with every WSM model, I was trying to bridge the gap between classic design and modern technology. 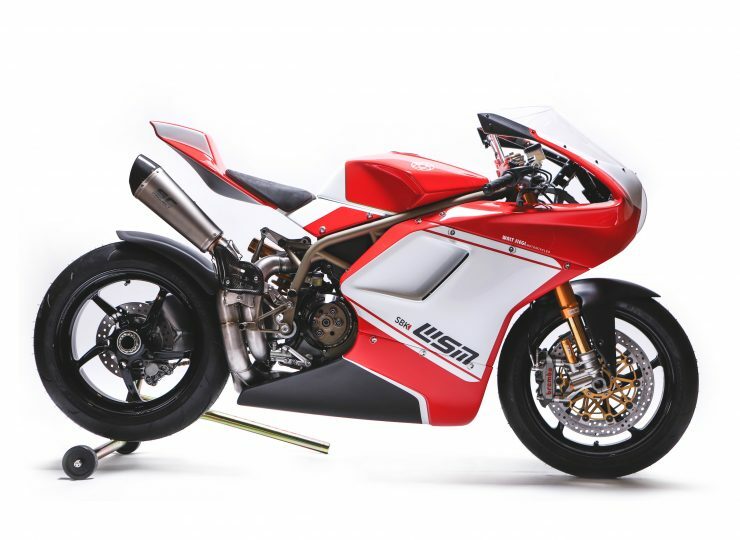 The design of this machine is my romance with classic race bikes blending, I hope seamlessly, with modern technology and design. 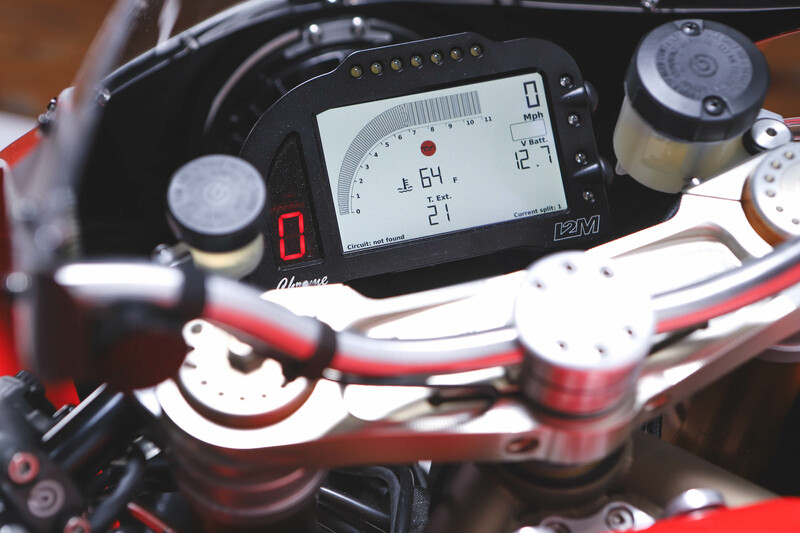 Since the bike is designed for high-output engines, our wiring harness had to include all the electronic necessities for controlling the power on the street and on the racetrack. That meant traction control and a clutchless quickshift up and down system were a must. The ECU is fully programmable to whatever the engine design and exhaust configurations are. Aran is an electronic wiz and figured it all out. 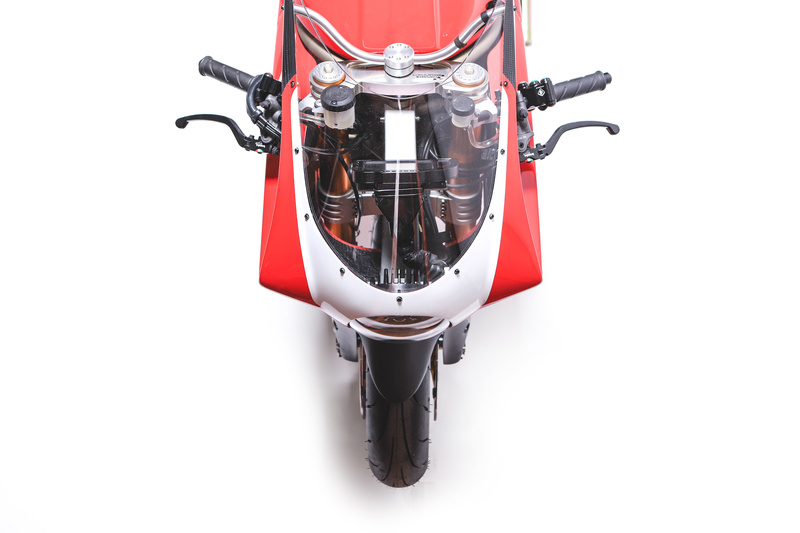 It was paramount for us to build the bike as light and as strong as possible, with as few parts as possible. For example, most bikes have a steel subframe and a separate seat and tail section. 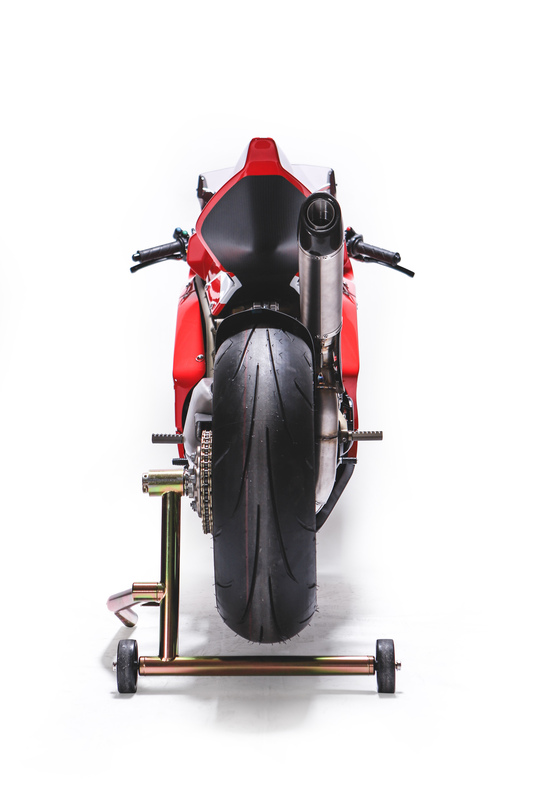 The WSM SBK subframe and tail is one unit made out of structural carbon fiber and weighs, unpainted, 1.8 lbs, or less than 1 kilo. The carbon fiber bodywork weighs all together 9 lbs. 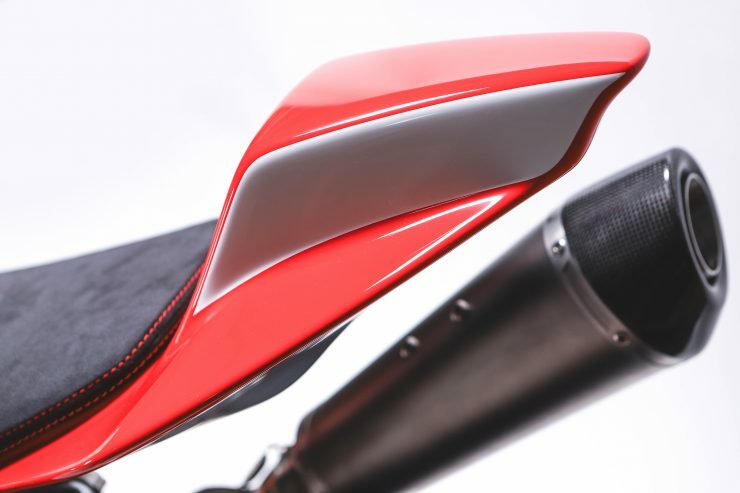 To further save weight, we designed an air-intake system (airbox and intake tubes hidden inside the fairing) in carbon fiber, instead of injection-molded plastic. 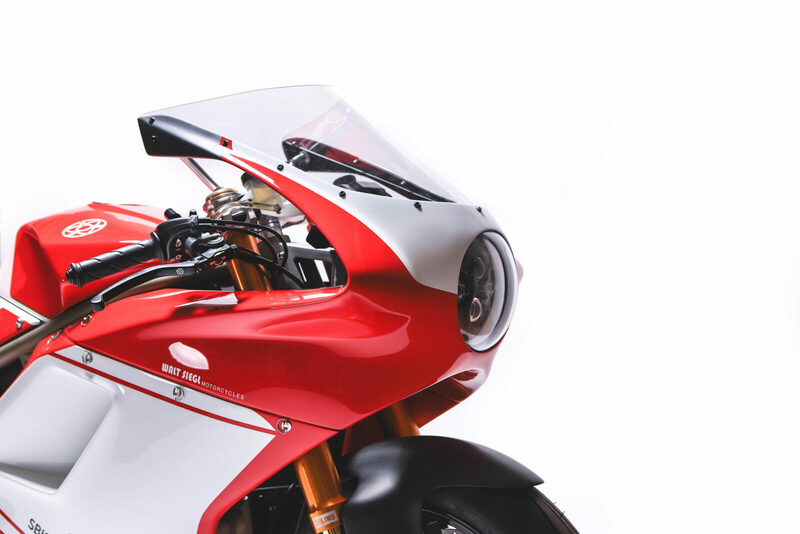 To further save weight, the floor of the tank was designed in such a way that it functions as a lid for the airbox. The air-cooled bike you see here weighs 340 lbs. 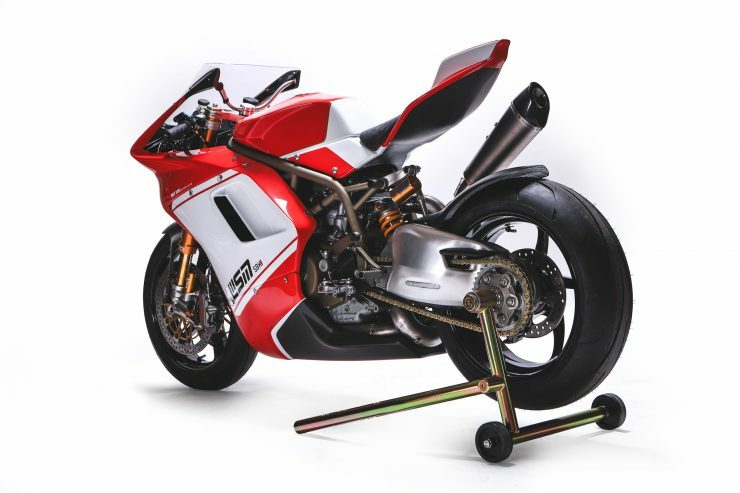 The four valve, with its additional cooling system and aluminum wheels weighs 355 lbs. 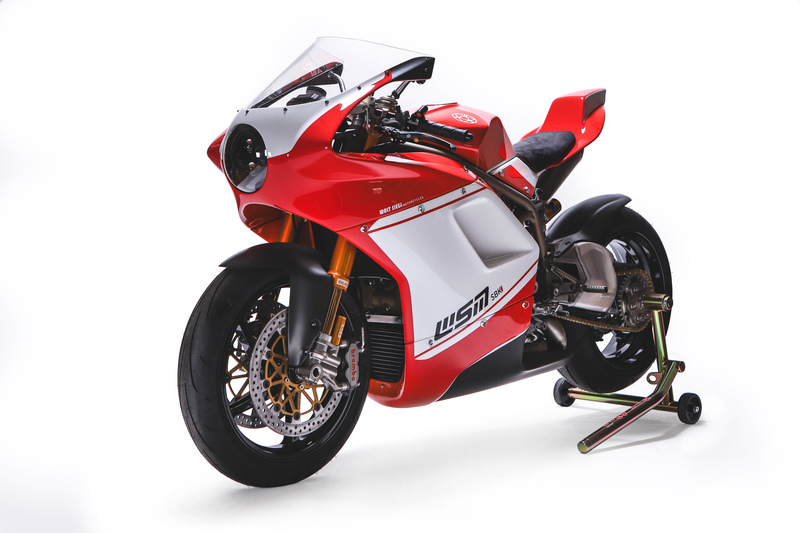 Nicholas, the owner of the WSM SBK #1 – also the owner of a WSM Bol d’Or and a WSM Leggero – and a dear friend put a deposit down on this project over dinner three years ago. 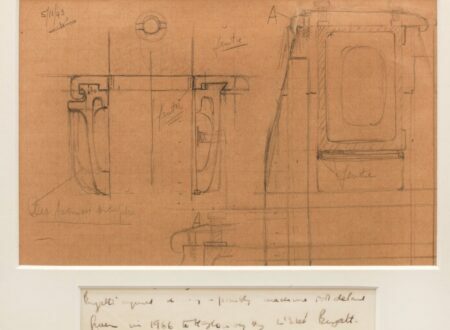 His trust, enthusiasm, and patience through this three-year undertaking was vital to the completion of this model. 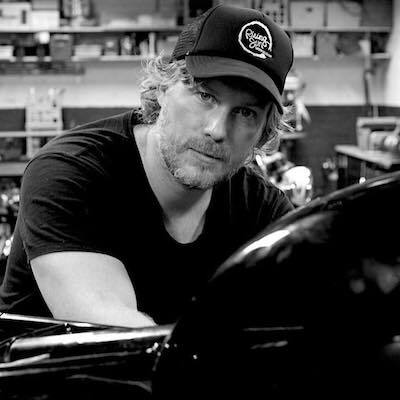 My ambition to build a true WSM Superbike asked everything of me and tested the resilience of my business. And I cannot emphasize enough the dedication and knowledge of the WSM team. Without Aran’s technical expertise and electronic smarts this project would not have happened. 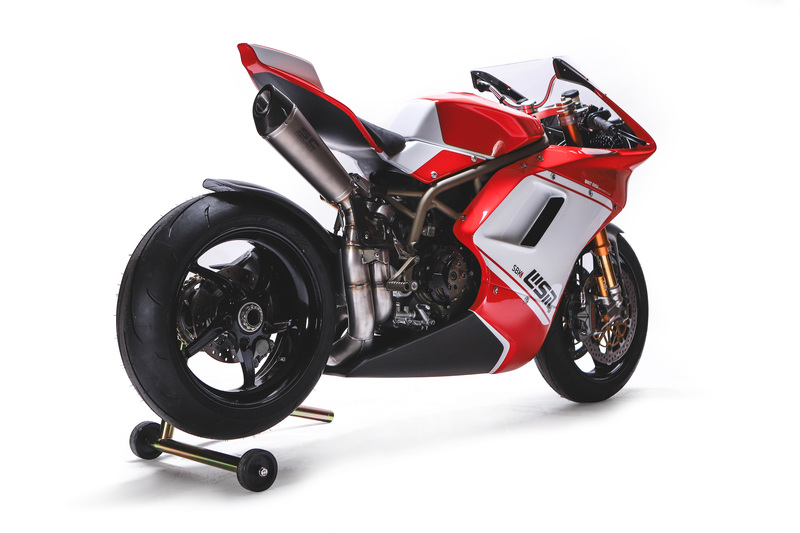 Suspension – Ohlins FGR World Superbike forks, WSM-spec Ohlins TTX shock, 1098 rear swingarm. Brakes – Brembo Monobloc calipers, Brembo 330mm front rotors, Spiegler Performance brake lines. 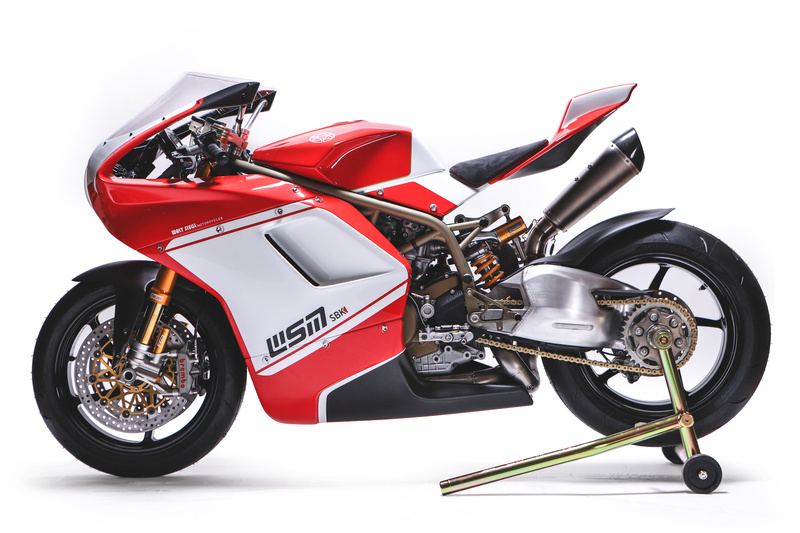 Bodywork – WSM pre-preg carbon fiber, carbon fiber airbox, intake tubes, WSM aluminum fairing stay. Custom Gustafsson windscreen. 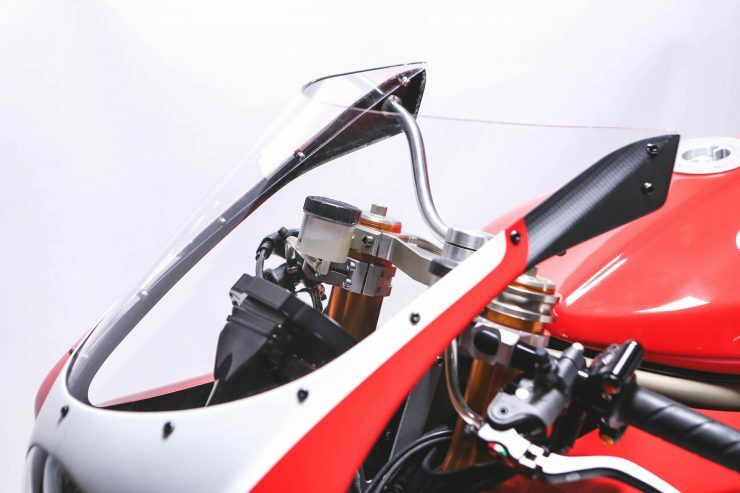 Frame – WSM aircraft spec chrome/moly tubing, structural carbon fiber subframe/tail. Engine – Bruce Meyers Performance 1098 engine. 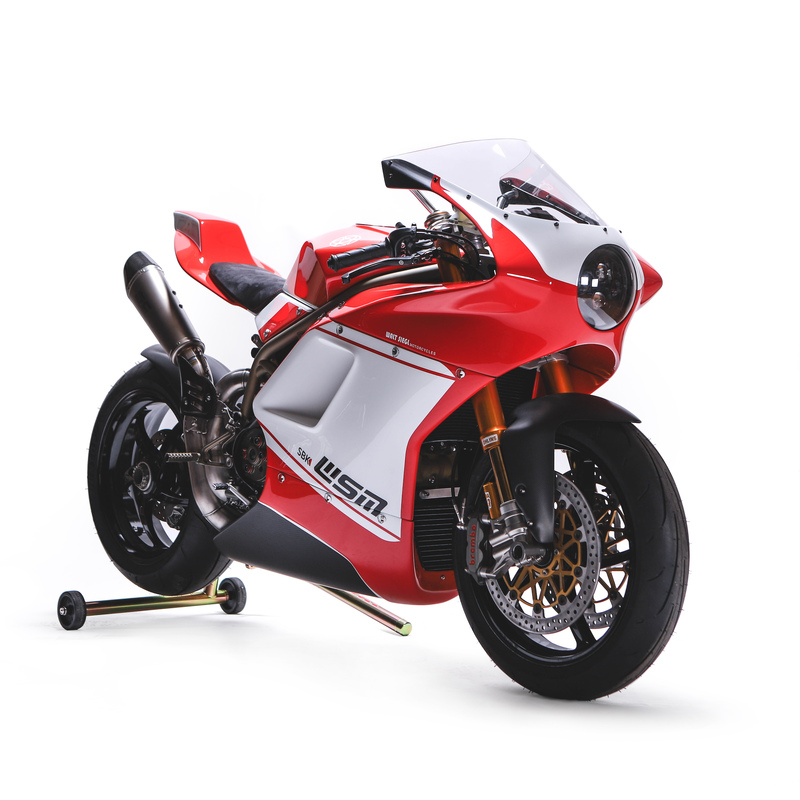 Electronics – WSM/Race Spec harness, traction control, clutchless quickshift, full interface dashboard with data acquisition system, Ducati ECU with WSM performance program. Wheels – OZ Racing wheels, Dunlop Q4 tires. Exhaust – WSM stainless, SC Project Muffler. 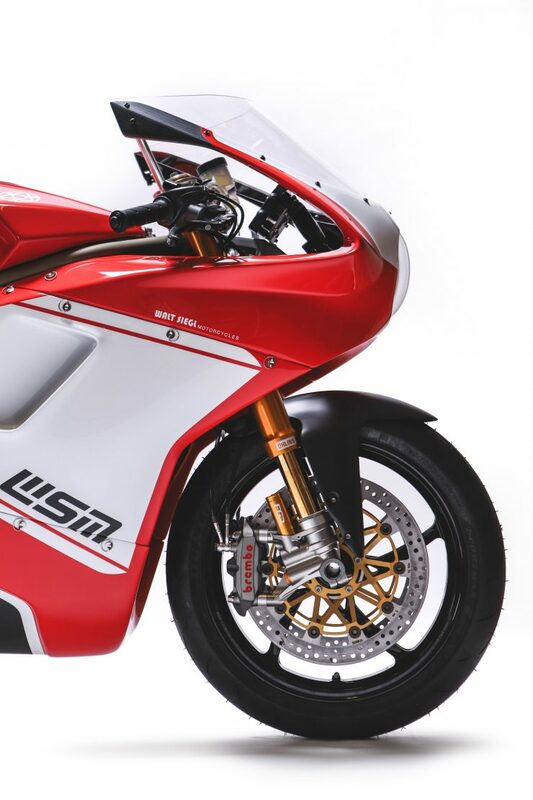 Foot Controls – WSM rearsets. 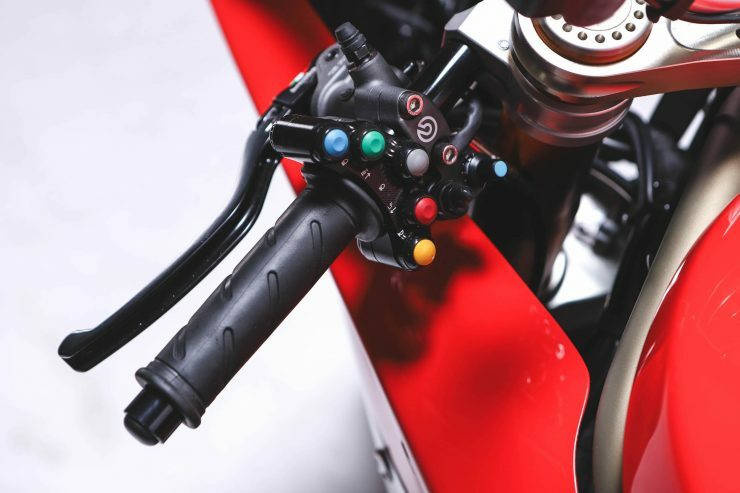 Hand Controls –Brembo radial master cylinders. Walt Siegl is building a production run of the WSM SBK, two have currently been built and more are on the way. 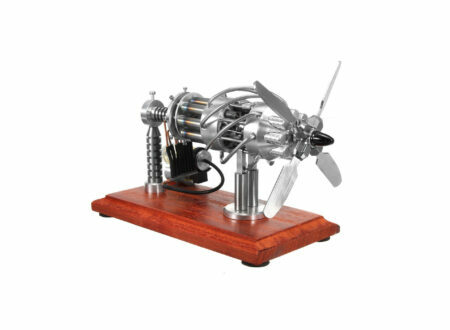 If you would like to enquire or order your own you can click here to visit his official website.